If you are in search of the best dog food for your Yorkie, there are several factors to consider including type, ingredients, and price. There are also several factors to watch out for including harmful additives, preservatives and artificial flavors and colors. Dog Food: Wet or Dry? For many owners, the decision between buying canned food or dry kibble is a matter of preference. However, it is important to consider that canned wet food can contain over 70% water, and therefore the nutrient content (which is displayed in percentages on the label) can be misleading. While some owners prefer the convenience of scooping out kibble over opening a can (and having to deal with the leftovers), you first need to consider what is best for your Yorkie. 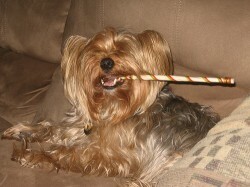 Like all toy breeds, Yorkies have very small mouths, and the tendency for their teeth to overcrowd is all too common. 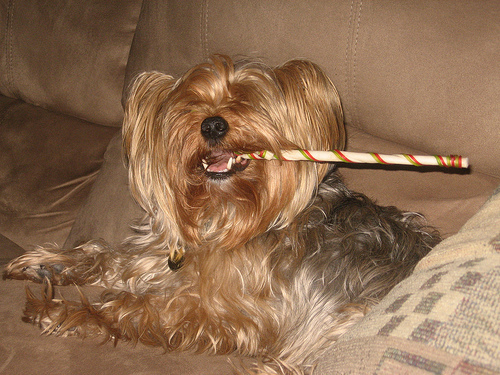 Because of this, many Yorkies are affected with dental disease since food can easily get stuck in between their teeth. Wet food is more likely to pose a problem than dry food (the latter of which can actually help clean by scraping the teeth and removing buildup). Regardless of whether you choose wet or dry food, the best course of action is to be sure to periodically clean your Yorkie’s teeth. Also, your Yorkie’s age will play a big factor in the type of food you choose. 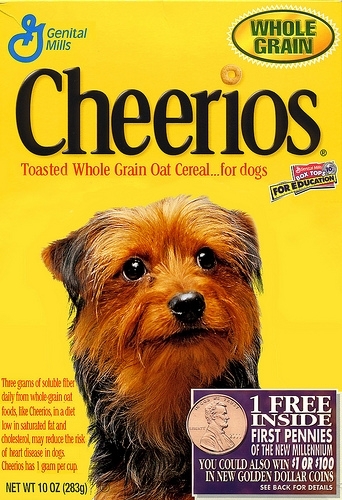 If your Yorkie is only a couple of months old, he will not be able to immediately start out on dry kibble. Most breeders recommend starting your puppy out with very bland food (such as a pureed mixture of chicken, broth, and milk) until they are old enough to start introducing dry food. Regardless of the breed of dog, learning to read and understand pet food labels is of vital importance when it comes to choosing a dog food. 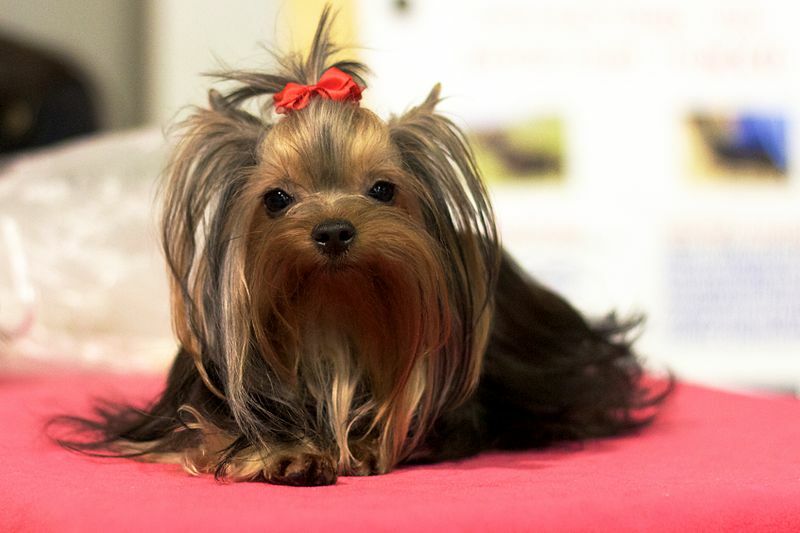 For Yorkies, however, the choice is even more important because this tiny dog has such a sensitive digestive system, and byproducts and fillers often make digestive issues worsen. Like labels on human food, dog food labels list ingredients in order from highest to lowest quantity (based on weight). Bearing this in mind, it is important to choose a dog food that lists meat as the first ingredient. Since dogs are carnivores (even little Yorkies—which were originally bred to hunt mice and rats! ), they need protein in their diets. Look for labels that start with real meat at the first ingredient such as chicken, fish, lamb, or bison, and avoid foods that list by-product meal as the first ingredient. Chicken by-product meal, for example, contains ground chicken parts including feathers, intestines, bones, heads, and feet. Many popular and well-known dog foods list meat at the 4th or 5th ingredient on the label. In this case, the most prominent ingredients of the food are usually fillers such as corn, soybean meal, animal digest, and ground wheat. While ingredients in dog food can be a controversial subject, most experts agree that if a dog were left to his own devices, he would choose a diet mainly of meat and not one primarily of grains. Apart of being difficult to digest, corn ranks high on the glycemic index and is known to cause allergies. For big-name dog food companies, however, corn is easy to grow and harvest and inexpensive to produce. Apart from which type of ingredients to look for, also be mindful of the grade of these ingredients. While human-grade (that is to say, USDA approved) ingredients will undoubtedly make for a more expensive food, you can be assured that that the food you are feeding Fido is healthy enough for you to eat as well. Unfortunately, the healthiest and most nutritious foods are usually the most expensive. The least expensive foods found at all major retail shops and grocery stores are regrettably ones that are filled with artificial flavors, colors, preservatives, and grains. As with human food, it’s usually junk food that costs less, and fresh produce and meats that cost the most. However, one of the best things about owning a Yorkie is that he doesn’t need a lot of food! 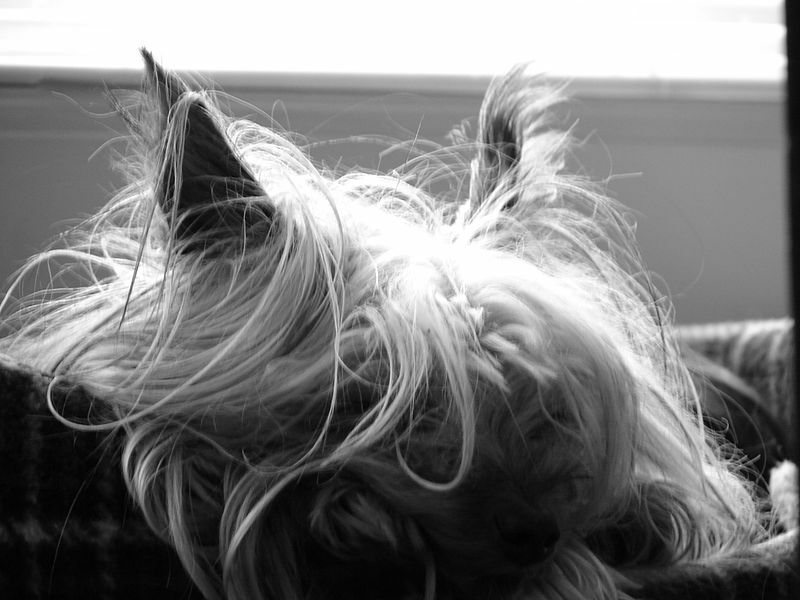 Weighing in at a maximum of 7 or 8 lbs, Yorkies typically do not over eat over a ½ cup of food per day. With that being said, even the most expensive dog foods can last you a long while. 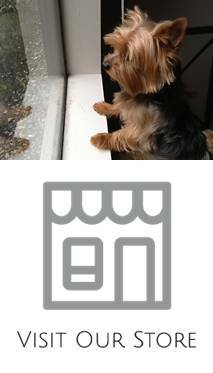 Many owners choose to “free feed” their Yorkies: that is, food is left out and available at all times so your dog can eat whenever they need or want. While this method works well for some owners and their Yorkies, remember that every dog is different, and while Yorkies are not prone to obesity like some other breeds, it is important to monitor your dog’s weight. 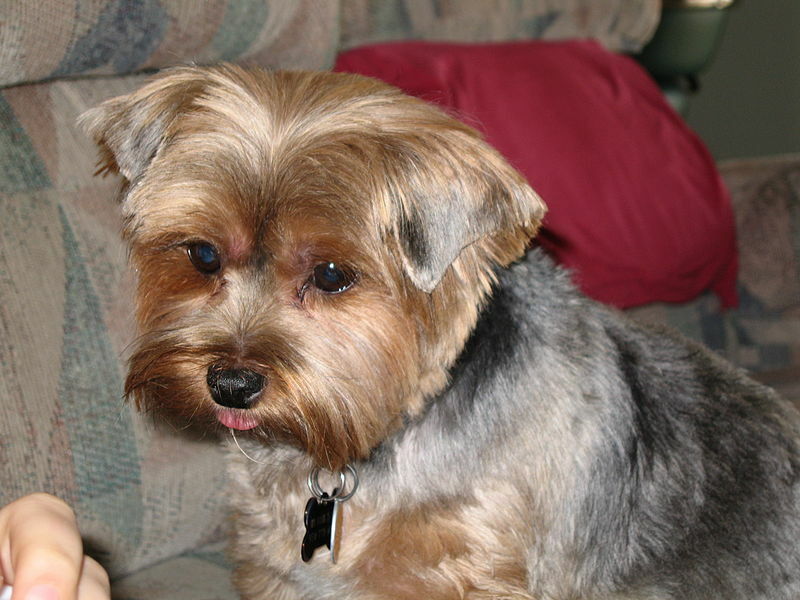 Other things to be wary of in your Yorkie’s food include preservatives, added sugars and flavors, and chemicals. A good rule of thumb is: if you can’t pronounce it, don’t eat it (or let your dog eat it!). Another helpful suggestion is to consider if the specific component is allowed in human food. Ethoxyquin, for example, is banned in several counties outside of the United States, and BHT and BHA (both common food additives in pet food) have been linked to cancer. In addition to avoiding these chemicals and preservatives, also be sure to understand that taglines like “all-natural”, “premium”, and “wholesome” are simply marketing strategies and have little to do with the actual ingredients. The only way to know for sure what is in your dog’s food is to read the label, which is mandated by federal law to be truthful. Size of the kibble. It may seem common sense, but your Yorkie may have a hard time actually eating his food if the kibble pieces are as large as his mouth! Go for a brand that is designed for small breed dogs. Change out food gradually. If you decide to change your Yorkie’s diet, don’t do so overnight. Changing foods immediately can cause stomach upset. Over the span of at least 7-10 days, gradually replace the old food with the new. Try your hand in the kitchen. If you are unsatisfied with your dog’s current food and don’t like the idea of having to decipher labels, make your own dog food. 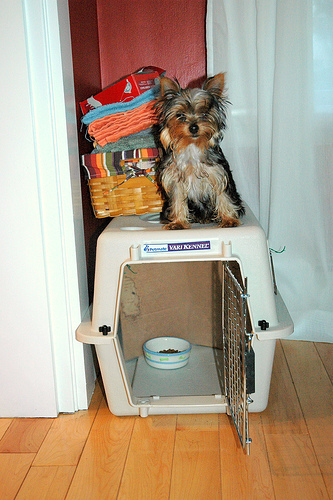 It can be a pretty simple task that your Yorkie will love. Start with a meat (and try to make it amount for 50% of the meal), add in some cooked vegetables, and a starch like cooked brown rice or potato. Our dogs have no choice but to eat the food we give them, so remember that when it comes time to decide which food to purchase for your dog, you usually get what you pay for in terms of quality. 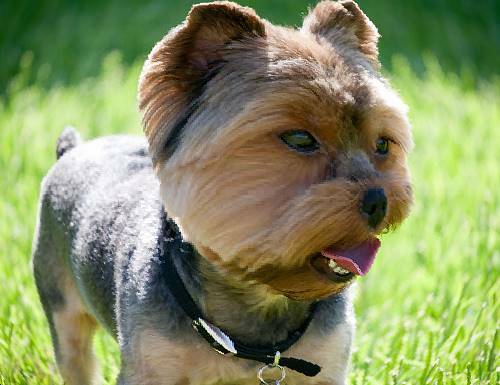 Always monitor your Yorkie’s behavior and physical appearance: if he becomes ill or develops allergies, one of the first steps your veterinarian may ask you to take is to change dog food. While genetic and environmental factors that affect your Yorkie’s health can be difficult (or impossible) to control, you have the ability to take charge of their diet: so do your research, and make an informed decision. My yorkie pup will not eat any type of dog food. I have tried every natural small breed puppy food on the market. I’ve tried several types of canned food. He will go 3 days without eating if I let him. I have resorted to chicken, pork chops, and eggs as that is truly all he will eat. Do you have any advise for me. He is 3 months old and stubborn as a 30vyr old mule.